Saudi Arabia and its allies are engaged in an unwinnable war in Yemen. The Saudi-led campaign called “Operation Decisive Storm” began in March 2015 with the aim of forcing Yemen’s Houthi rebels to withdraw from the Yemeni capital of Sanaa and reinstalling Yemen’s internationally recognized government from exile in Saudi Arabia. Despite 20 months of aerial bombardment and an estimated expenditure of $5 billion by Saudi Arabia alone, the results of the war are anything but decisive (Independent, October 23). The Houthis retain control of northwest Yemen, and their alliance with Yemen’s ancien régime led by former Yemeni president Ali Abdullah Saleh has deepened. The Houthis enjoy broader support than ever before. The war has helped the Houthis transform themselves from a parochial rebel movement to a national movement that routinely casts itself as a “defender of the nation” in the face of Saudi aggression. These tactics are unlikely to break the resolve of the Houthis or their allies. Nor will they have a significant impact on the Houthis’ ability to continue to fight. The Houthi organization is inherently resilient, determined and increasingly able to meld its well-honed guerrilla tactics and forces with conventional ones. What the ongoing war will ensure – and likely already has – is that Yemen will endure a prolonged period of heightened instability that may significantly impact the stability of the region. The Houthis, or Ansar Allah, is an organization forged by years of war in some of the most rugged terrain on the planet. Since their first war with the Yemeni government in 2004, Houthi fighters have proved themselves to be the masters of the mountains and canyons in which they fight. The Houthis’ mastery of irregular warfare enabled them to survive and evolve from a small parochial organization to one that was able to move out of the mountains and seize large parts of Yemen in 2014. Zaidism is a conservative branch of Shia Islam and is closer doctrinally to Sunni Islam than to the dominant Twelver or Jafari Shia sect. The Believing Youth then evolved into a fully-fledged rebel group known as the Houthi movement. This lengthy metamorphosis was greatly accelerated by the death of Hussein al-Houthi at the hands of government troops in 2004. From 2004 until the beginning of the so-called Arab Spring, the Houthis engaged in six protracted wars with the Yemeni government. There are many reasons for the Houthis’ success as an armed rebel movement, but first and foremost is their intimate knowledge of the rugged mountains and canyons in which they fight. The Houthis and the tribesmen who make up the bulk of their loose membership have long understood that Yemen’s mountains are a remarkably effective force multiplier. Mountains favor defensive warfare. Those who have invaded Yemen in the past – the Ottoman Turks twice and, later, the Egyptians – quickly discovered that mountainous northwest Yemen, just like Afghanistan, is a graveyard for invaders. Second, the Houthi leadership has worked tirelessly to build personal and organizational relationships with a range of tribes and clans, most of whose members include both Zaidi Shias and Sunnis. Third, the Houthi leadership – most particularly in the early years – rewarded initiative and functioned somewhat along the lines of a meritocracy. Those who led from the front, like some members of the Houthi family, were given more responsibility. This stands in stark contrast to the Yemeni Armed Forces where nepotism and tribal identities largely determine who advances through the ranks. It was a combination of the Houthis’ fighting acumen and the organization’s early reputation for being relatively meritocratic and uncorrupt that allowed it to rapidly fill the power vacuum that developed after the 2011 popular uprising against the Saleh government. The Houthis leveraged their early support for the anti-Saleh government protesters to win supporters and to build alliances with key tribal power blocs. In a further demonstration of the Houthis’ political pragmatism, in 2014 the leadership formed an alliance with their former adversary, ex-president Ali Abdullah Saleh. This relationship, and the fact that Saleh and his sons retained the loyalty of large parts of the Yemeni Army, facilitated the Houthis’ rapid and largely bloodless takeover of Sanaa in September 2014 (Middle East Eye, September 2014). In an attempt to increase the efficacy of the campaign against the Houthis, Saudi Arabia and its partners – primarily the UAE – are focusing more attention on using local proxies. However, this is likely to prove as ineffective as the other two parts of their strategy. Systems of loyalty and patronage in Yemen remain byzantine and fundamentally local. 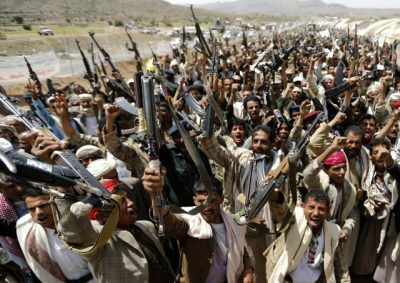 Saudi Arabia and the UAE have spent months training and equipping militias to fight on behalf of Yemen’s unpopular president-in-exile, Abd Rabbuh Mansur Hadi (Emirates News Agency, November 2015). Much of their effort has focused on recruiting tribesmen from the perennially fractious but strategic and resource rich governorate of Marib, located in central Yemen (The National, November 2015). Despite being relatively well armed and well provisioned, these “pro-Hadi” militias have made little or no progress against the Houthis and those tribes allied with them. The front-lines in the war have hardly shifted for the last nine months in spite of repeated claims by Saudi Arabia and the UAE that a major offensive to re-take Sanaa is imminent or even already underway. While the Saudi and UAE backed militias may be making little progress against the Houthis and their allies, this is not the case with al-Qaeda in the Arabian Peninsula (AQAP). AQAP, which is benefiting from the war in Yemen more than any other organization, is successfully engaging Houthi forces in key Yemeni governorates. AQAP is well organized and determined to secure as much influence in vulnerable parts of Yemen as possible. In what are dangerous parallels with the actions of rebel groups and militant Salafi organizations in Syria, AQAP is actively enmeshing itself with genuine anti-Houthi/pro-government militias. AQAP is able to do this because it is motivated, at least partly, by ideology and, most importantly, because it is a relatively well-run organization with a diffuse but effective chain of command. This contrasts with the informal and fluid leadership of tribal militias and the quickly assembled pro-Hadi forces that are typically more motivated by personal gain than by the prospect of engaging and defeating their enemies. Before the start of Operation Decisive Storm, AQAP was an organization that was on the ropes financially and strategically. As the sworn enemies of the Houthis and all Shia (deemed to be heretics by Salafists), AQAP was locked in a deadly battle with the Houthis and their allies. It was a battle they were losing. AQAP was being slowly pushed out of key governorates like al-Bayda by tribal militias supported by the Houthis. In many areas, as it has tended to do in the past, AQAP’s leadership was too assertive and acted to suppress traditional tribal leadership and customs rather than co-opt them. Thus, they lost the critical support of the communities in which they lived and fought. AQAP is now a part of what can broadly be called anti-Houthi forces (The New Arab, February 23). How and to what extent it is able to capitalize on its recent gains remains to be seen, but what is certain is that AQAP is now a much stronger organization than it was even six months ago. As AQAP deepens its involvement in the civil war between those forces allied with the Houthis and those forces that oppose them, it will become increasingly difficult for Saudi Arabia and its allies to ensure that AQAP is not a beneficiary of aid meant for their own anti-Houthi forces. As the war in Yemen continues, AQAP – just as with militant Salafi and al-Qaeda linked groups in Syria fighting the government of Bashar al-Assad – might increasingly be viewed as a useful and effective proxy against the Houthis. Given that AQAP has struck targets in Saudi Arabia in the past, indirectly enabling them is likely to prove dangerous for the House of Saud in the near future. Saudi Arabia and its partners are engaged in a war that has no clear strategy for achieving its objectives of forcing the Houthis to retreat and reinstalling a pro-Saudi government. Reliance on fickle allies and on dangerous militant Salafi groups to fight the Houthis will not enable Saudi Arabia to achieve its objectives. But despite numerous reports of Saudi troops massing on the Yemeni border, it is highly unlikely that the kingdom will deploy anything but a token number of troops to Yemen. The use of armed proxies will likely be the extent of its involvement on the ground. The reasons for this are complex and have more to do with internal Saudi politics than a sound understanding of what risks these troops would face. However, if Saudi Arabia and its partners were to deploy troops to northwest Yemen, they would face a battlefield scenario similar to what Israel faced when it invaded Lebanon in 2006, but without the benefit of the Israeli Defense Force’s (IDF) disciplined and well-trained officers and soldiers. In 2006, Hezbollah, an organization that has undeniably close ties to Iran, fought the IDF to a standstill by using a deadly mix of conventional and irregular tactics. The Houthis who are now allied with, and to some degree have incorporated, some of the best-trained units from the Yemeni Army, would likely employ a comparable mix of irregular and conventional tactics against an invading force. Furthermore, they would have the benefit of Yemen’s rugged terrain. While the frequent claims about Iran supplying the Houthis with weapons are dubious – Yemen, now more than ever, is awash in weapons – it is highly probable that the Houthi leadership has received advice and guidance from Hezbollah and its Iranian advisors. A ground assault by Saudi Arabia and UAE forces remains highly unlikely and would no doubt prove calamitous for both nations. Thus, Saudi Arabia seems set to continue its costly but futile aerial campaign, while continuing to arm a disparate mix of tribal militias that are incapable and largely unwilling to take on the Houthis and their allies. Saudi Arabia’s three-pronged strategy will not defeat the Houthis and their allies, it will only further impoverish the millions of Yemenis who now have no jobs, no access to health care and who are increasingly food insecure. The air strikes that have targeted infrastructure, schools, hospitals and homes have bolstered support for the Houthis and allowed them to cast themselves as defenders of a nation under attack by a foreign power. The Saudi-led campaign has also helped create a space in which militant Salafi organizations, in particular AQAP, can operate with a high degree of freedom and have access to evermore desperate recruits. In order to examine what might stabilize Yemen, it is helpful to look back to the 1962-70 civil war between Royalist and Republican forces in what was then North Yemen. This war was only settled after the foreign powers involved in it – Egypt and Saudi Arabia – withdrew. In that war, Saudi Arabia supported the Royalists, and ironically helped arm and provision the grandfathers of many of the men who now call themselves Houthis. Neither the Royalists nor the Republicans were able to defeat one another even with, in the case of the Republicans, the help of 50,000 Egyptian troops. The war was finally ended by Yemeni-driven negotiations that allowed both sides in the conflict to save face, reconcile their grievances and participate in governing what became the Yemen Arab Republic. Admittedly the current conflict in Yemen is more complex as it encompasses both north and south Yemen and all the tensions that accompany a country that was never properly unified. Despite the north-south tensions, a process similar to the one that settled the 1962-70 civil war was underway before Saudi Arabia launched Operation Decisive Storm in 2015. With the help of then UN Special Envoy to Yemen, Jamal Benomar, all sides in the current conflict were close to reaching an interim power-sharing agreement. The Houthis had a working relationship with the leadership of many of the southern separatist movements as both groups had been oppressed by the Saleh government. But thanks to the Houthis’ push south, their brutal occupation of Aden and abuses by all sides, this relationship has broken down. Just as in Yemen’s last civil war, neither side in the current conflict will be able to defeat the other—even with outside support. The only solution is to restart Yemeni driven negotiations. The alternative is years of low-level conflict that will spread beyond Yemen’s borders and negatively impact regional stability and security. The reasons behind the rise of the Houthis are complex and beyond the scope of this article. For requisite background see: Barak Salamoni, Regime and Periphery in Northern Yemen: The Huthi Phenomenon, RAND Corporation, 2010; and for a more nuanced look at the reasons behind the growth of the Houthi Movement, see: Isa Blumi, Chaos in Yemen: Societal Collapse and the New Authoritarianism, Routledge, 2010). See: Jesse Ferris, Nasser’s Gamble: How Intervention in Yemen Caused the Six Day War and the Decline of Egyptian Power, Princeton University Press, 2012. Leading from the front is something that – at least until 2012 – members of the Houthi leadership practiced. The Houthis’ current leader Abdul Malik al-Houthi routinely led men in battles with the Yemeni Army. It is important to note that demonstrating bravery and proving oneself capable and competent are requirements for a leader as stipulated by Zaidi doctrine. Following the popular revolt against the Saleh government in 2011, the Houthis seized vast stores of weapons and materiel that were abandoned by Yemeni Army troops that left their bases, particularly in al-Jawf. Since then, many Yemeni Army units have allied themselves with the Houthis and consequently the Houthis have access to a wide range light, medium and heavy weapon systems. However, reports of Iran supplying the Houthis with weapons persist. Most recently, Gulf-based analysts and news sites have claimed that weapons are being smuggled from Iran to Oman and then across the Omani border to Yemen. Aside from the fact that the Houthis do not require additional weapons, this is highly unlikely because the Omani government clearly values and benefits from its neutrality. It would not risk its political position to facilitate arms smuggling. Because Oman’s border is secured by well trained and disciplined troops, many of which are drawn from the tribes whose land makes up the border, if weapons were being smuggled, it would not go unnoticed or unchecked. See Jonathan Spyer, “Changing Battlefields Drive Insurgent Innovation,” Jane’s Intelligence Review, November 2016. The Houthis have posted hours of footage of their attacks on Saudi forces on Youtube. The centrality of ATGMs to their cross-border raids is evident. The Houthi leadership, in particular Abdul Malek al-Houthi, is seemingly well versed in literature pertaining to irregular warfare and is particularly interested in how Hezbollah and the Eritreans fused irregular warfare tactics with conventional tactics.